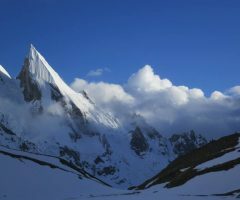 Laila Peak is one of the most beautiful mountains in Pakistan, The Peak is synonymous with its west face which drops down the mountains at almost uniform gradient forming a giant ramp its northern and eastern sides consist of contrasting steep granite. 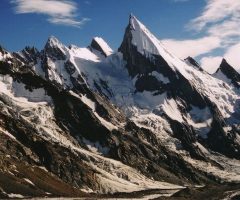 The mountain is located east of Gondogoro valley and west of the Chogolisa valley in the Masherbrum mountains of Baltistan, Most people have set eyes on the Peak after crossing Gondogoro La from Concordia and K2 base camp. 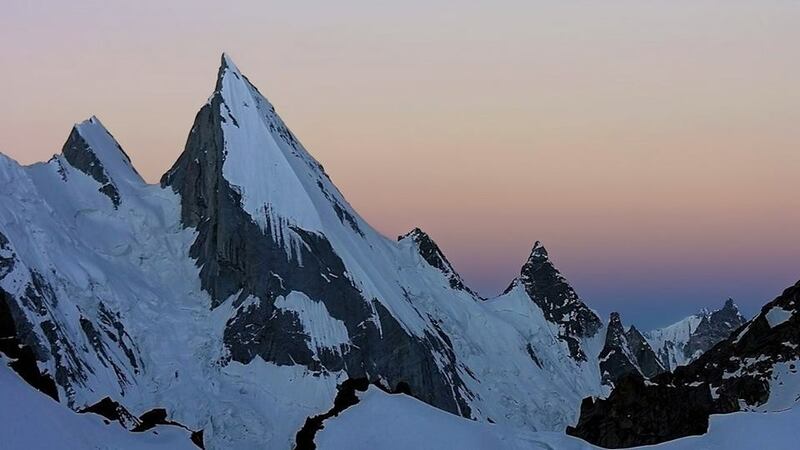 Laila Peak is a(6.096m) high mountain, part of the Karakoram mountain range in Gilgit-Baltistan region Pakistan, The peak is well known for its beautiful distinctive spear-like shape, Laila Peak has only been climbed a few times. 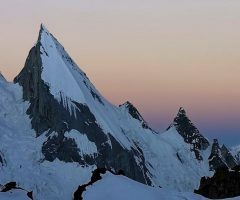 Unsurprising given that its dramatic northwest face features a 45-55 degree slope of more than 1.500m. 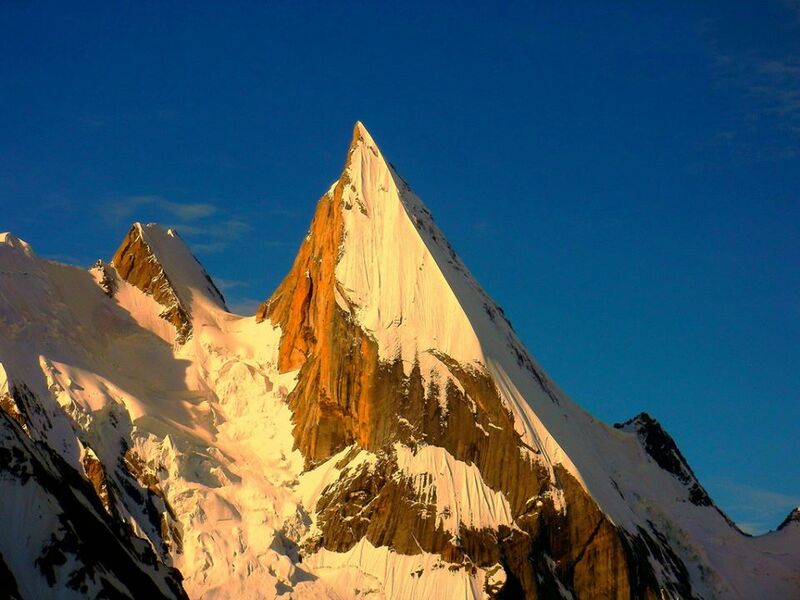 Like many peaks of this height in the Karakoram climbed in the 80s and 90s, the first ascents were done illegally without the relevant permits. Climbs therefore received limited initial acknowledgment. 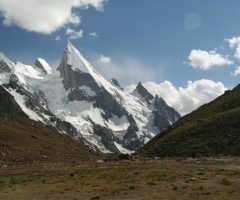 The first ascent was by a four-man British team including Simon Yates, Sean Smith and Mark Miller who climbed the peak in 1987 via the west face from Gondogoro Glacier. 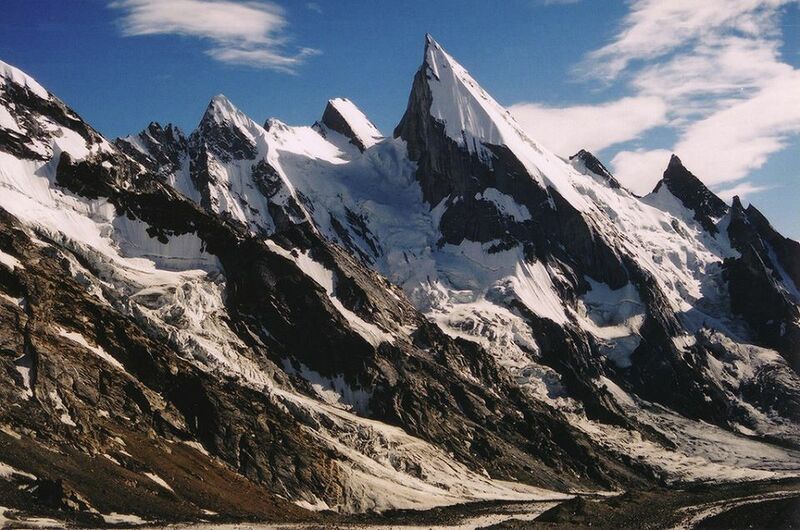 During the early 90s, a German team climbed the mountain by the same route with Swiss team also summiting in 1993. 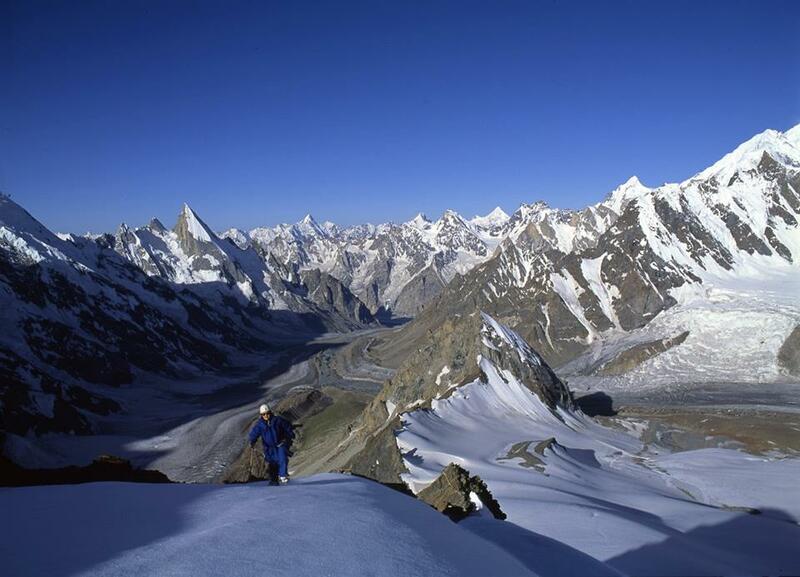 The mountain can be climbed by a strong party in a single day from a high camp on the east side of Gondogoro glacier. 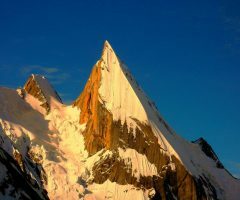 The peak has a remote setting in the heart of the Central Karakoram but is relatively easy to reach from the village of Hushe which is itself connected by road to Skardu. 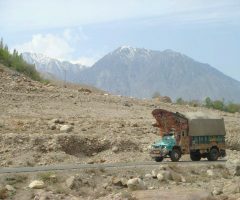 There is daily public transport service by Jeep between Hushe to Skardu in around eight hours. Arrival at Islamabad, meet and greet with our company representative, transfer to hotel, briefing at Alpine Club of Pakistan, Sightseeing in Rawalpindi and Islamabad, Rawalpindi is lively bustling city with crowded streets and colorful bazaars, through its lacks the grand monuments, The bazaar should appeal to anyone with the desire to see the real Pakistan, Islamabad is new Capital well-planned city of Pakistan is lush green at the footsteps of Potohar hills. We shall visit Faisal mosque, Shakarpariyaan Gardens with a visit of Lok versa and traditional Heritage, We do our lunch at a local restaurant, evening back to the hotel for dinner and overnight. 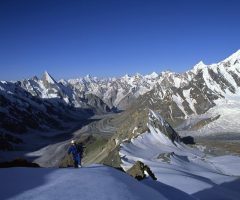 Early in the morning we do our breakfast in the hotel, proceed to Chilas,(480km) en route we will make stops at Besham for lunch, Karakoram highway is most exciting and thrilling. It is a monument to the engineering feast and one of the most spectacular roads and world’s best highest metalled border crossing. 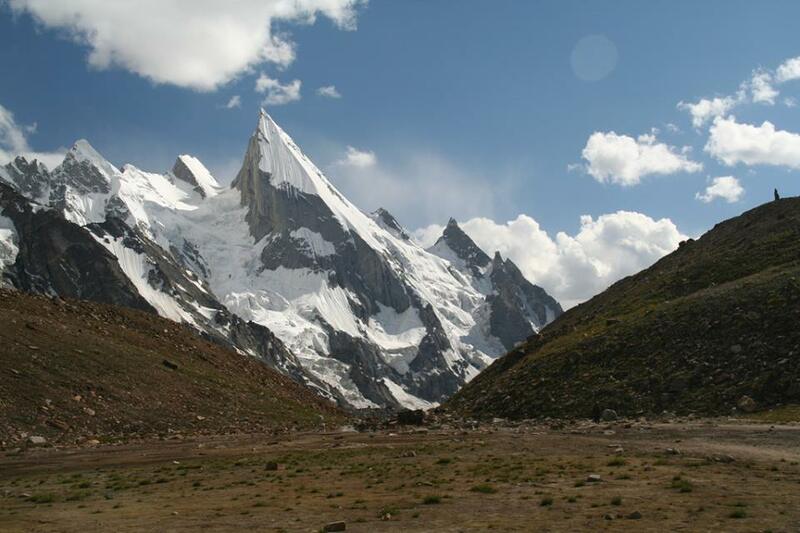 It connects Pakistan and China stretching over a distance of 1300 km between Islamabad and Kashgar, The Karakoram highway was constructed jointly by the Chinese and Pakistani bin 1960s and finally constructed in 1976, It is an engineering wonder, but the cost of many lives. Dinner and overnight in Chilas. After breakfast in the hotel, we drive to Skardu, (6-7 hrs) drive. en route we do our lunch at Stak Nala, Upon arrival transfer to hotel, afternoon visit local bazaar, evening back to the hotel for dinner and overnight. 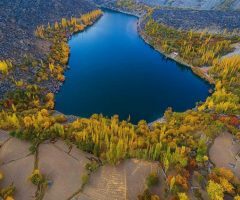 Final preparation day at Skardu, afternoon free for relaxing or just visit the local market, explore skardu and surrounding, evening back to the hotel for dinner and overnight. 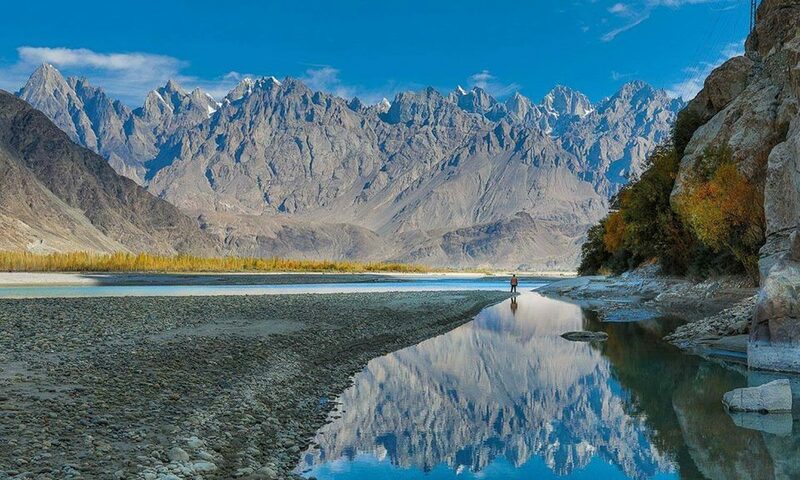 After breakfast in hotel drive to Hushe Valley, (5-7hrs) drive to Hushe via Khaplu Valley, We will make stop at Khaplu for lunch, after lunch some walk-in Khaplu bazaar, further drive to Hushe, dinner, and overnight in Camp. 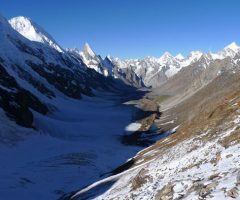 Breakfast in camp at Hushe, We start trek towards Saicho, today we have smooth trek until Saicho, easy walk with the pleasant view of Masherbrum Peak (7821m) almost (4-5 hrs) we will reach at Saicho campsite, afternoon free for exploration around campsite, dinner, and overnight in camp. 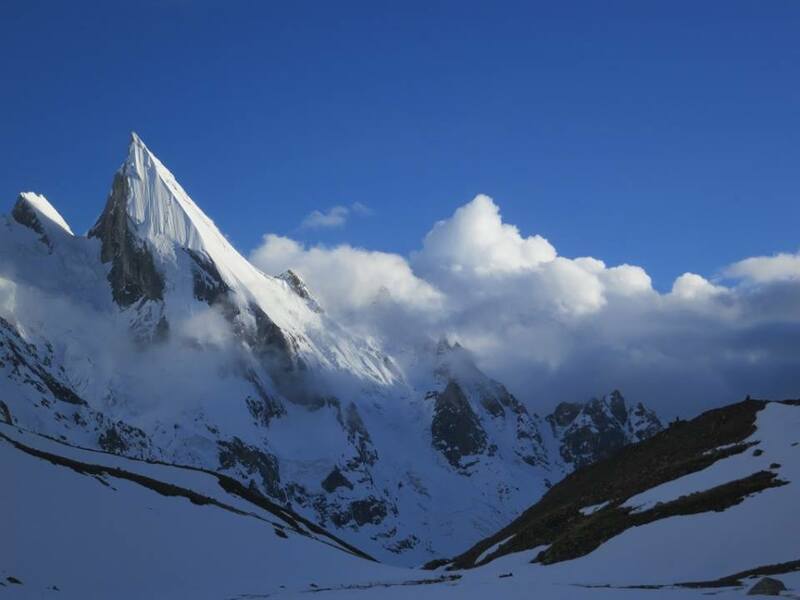 After breakfast at Saicho, we start our trek towards Laila BC. 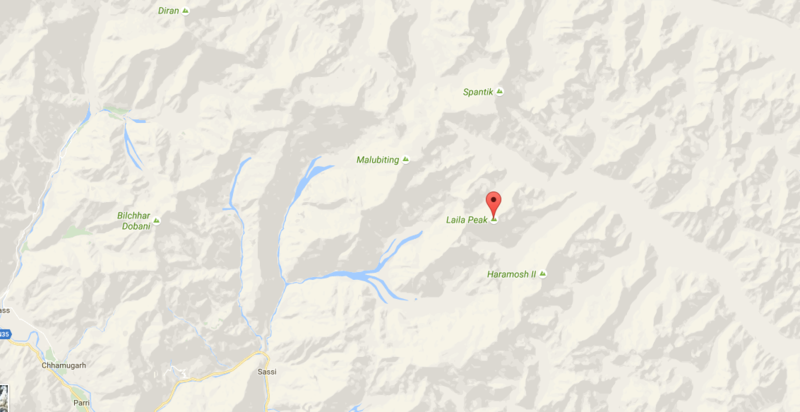 (4.535m) almost (5-6 hrs) trek until Laila Base Camp. 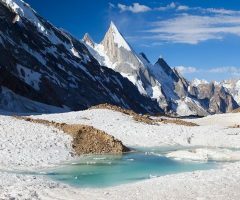 We establish our Camp just close to Gondogoro Glacier, from here you can see Masherbrum Peak( 7821m) dinner and overnight in camp. 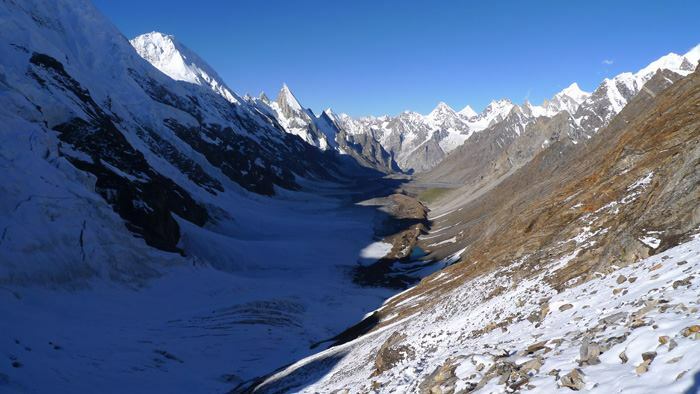 15 days reserve for Acclimatization and climbing, The mountain can be climb in few days from an advanced base camp at (5.765m) on the east side of the Gondogoro Glacier, with approximately 1.500m ascent, climbing is mid-grade with an inclination of 55 degrees. The lower section of the climb is mixed giving way progressively more ice towards the summit. Today we have an easy walk until Saicho, (5-6hrs) on the way we will do stop for lunch, further Trek to Saicho, afternoon free for relaxing, dinner and overnight in camp. After breakfast in camp at Saicho, trek to Hushe along the east bank of the river, an easy walk until Hushe,(4-5hrs) afternoon visit Hushe village, meet local people and see the lifestyle, lunch dinner and overnight in camp. 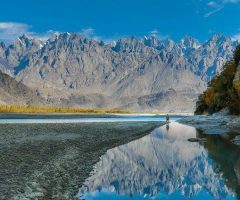 After breakfast, we drive by 4WD Jeeps to Skardu, via Kande, and Khaplu valley, Lunch stop at Khaplu, proceed to Skardu, Upon arrival transfer to hotel, dinner, and overnight in hotel. 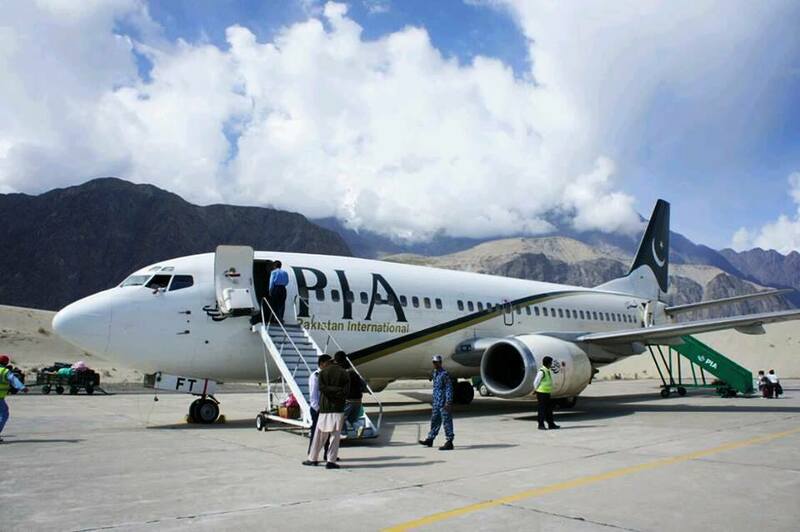 a) Fly to Islamabad. 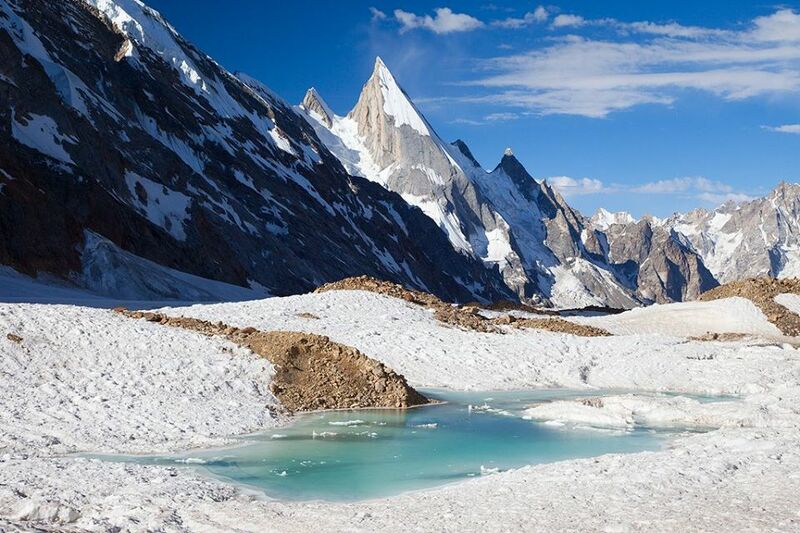 (flight is subject to weather), upon arrival transfer to hotel, visit alpine club of Pakistan for debriefing, afternoon free for shopping or just relaxing. Evening back to the hotel for dinner and overnight. 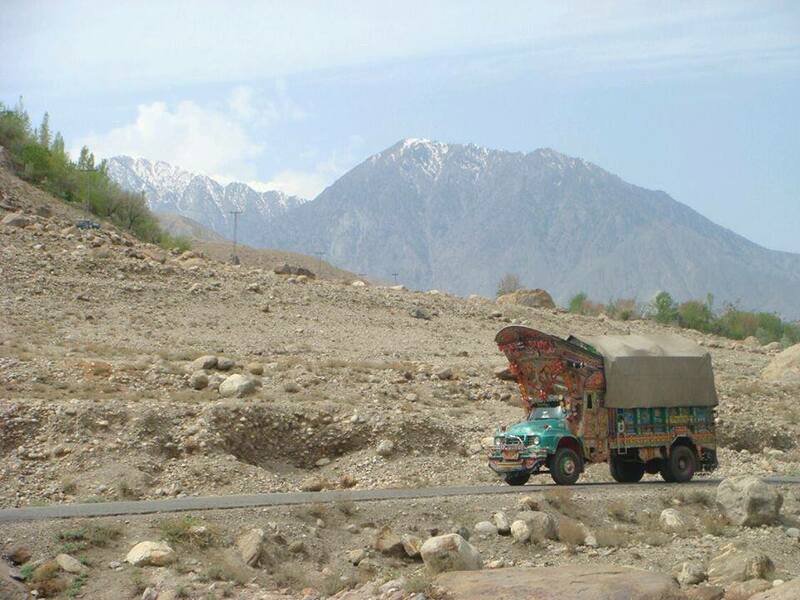 b) In case of cancellation of flight (7-8 hrs) drive to Chilas on Skardu road along the bank of Indus river. En route we will make the lunch stop at Stak Nala, upon arrival transfer to hotel in Chilas. 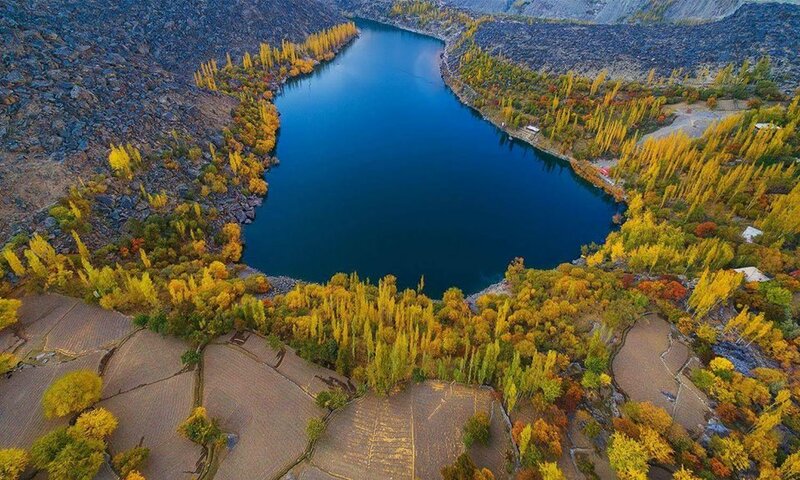 Free day for shopping or sightseeing in Islamabad, or drive from Chilas to Islamabad.(480km). almost 12-13 hrs) drive. upon arrival transfer to hotel for dinner and overnight. 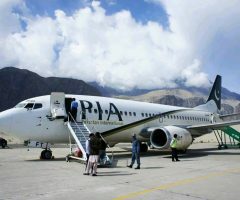 Transfer to Islamabad International airport for homeland flight. End of services.